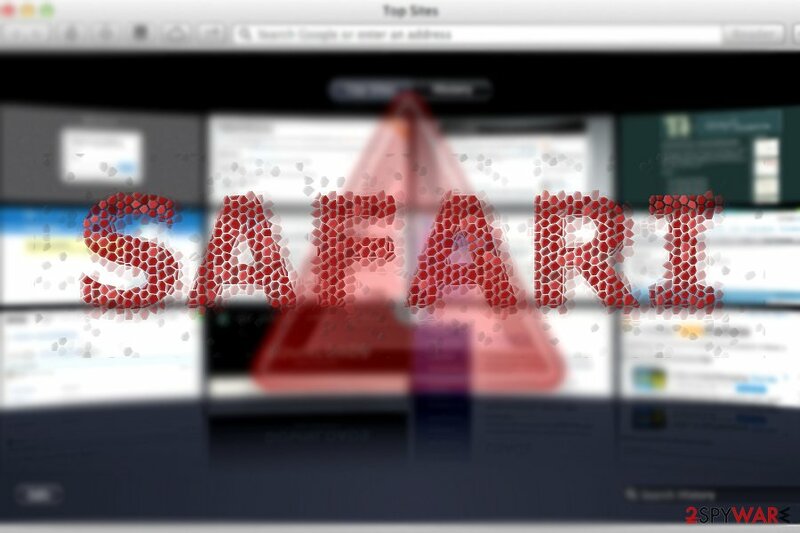 Safari virus is the term describing malware that affects Safari browser. While in most of the cases victims are interrupted by fake security alerts, ads, and redirects, this cyber infection can also lead its victims to stolen data. If any of these signs are apparent, check your device with Reimage. 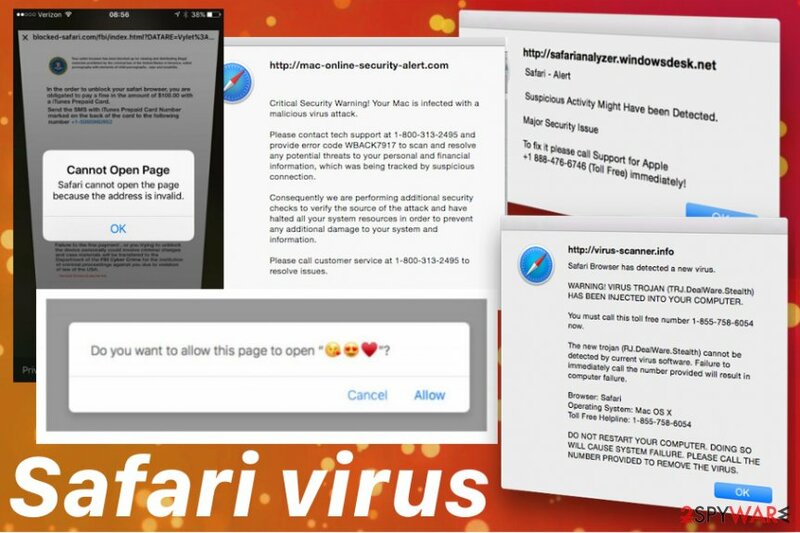 Safari virus is a program related to browser hijacker or adware-type intruder that affects the performance of your browser and even device in general. Safari virus is the term including malware that particularly targets Safari browser and makes the use of this web browser frustrating. The issue is closely related to the PUP which interrupts browsing sessions after modifying the system, filling it with required components and initiating other dangerous changes. As the title suggests, the virus can be seen only on Safari. The signs of its persistence are annoying alerts pushing you to install certain applications, troublesome commercial ads, and similar. However, the main issue related to Safari redirect virus is constant redirects to suspicious or possibly malicious sites. 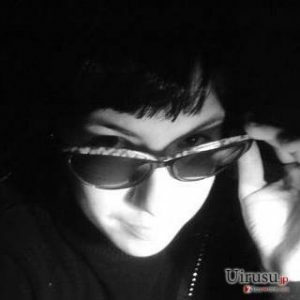 Users have been complaining about the suspicious behavior of the Safari in various online forums. Many people still believe the myth that Apple devices are immune to malware and cyber threats. However, various investigations have revealed multiple security vulnerabilities in macOS and Safari. Additionally, Mac malware has now been transferred to a separate category of viruses, so believe that the system is vulnerable as any other OS. Programs like this Safari virus have the main purpose of delivering commercial content to your screen so the revenue is generated from you clicks on those pop-up ads, banners or redirects. Unfortunately, these redirect may lead you to insecure websites and browsing on possibly malicious pages too often leads to malware infections. However, the more disturbing fact about this potentially unwanted program is that the browser is not performing as it supposed to because when Safari redirects to websites it is not loading anything and often closes the tab or the program automatically. Browsing online becomes resultless because you cannot access wanted sites or search online as before. Safari malware does not operate via a specific application. Thus, its detection might take longer than usual. Furthermore, you may not find any shady software in the system list to uninstall, though this infection may facilitate the installation of shady applications and browser content. Let us elaborate on possible behavior and symptoms which will help you determine whether your Safari browser might have been compromised. If you already can’t ward off annoying ads, you complete Safari virus removal by launching an anti-spyware tool, such as Reimage. Safari virus is the PUP that creates redirects to suspicious websites or even scares people with fake malware detection alerts. Cramming you with sponsored ads. Sooner or later, you will realize that there is a malicious presence on the browser. 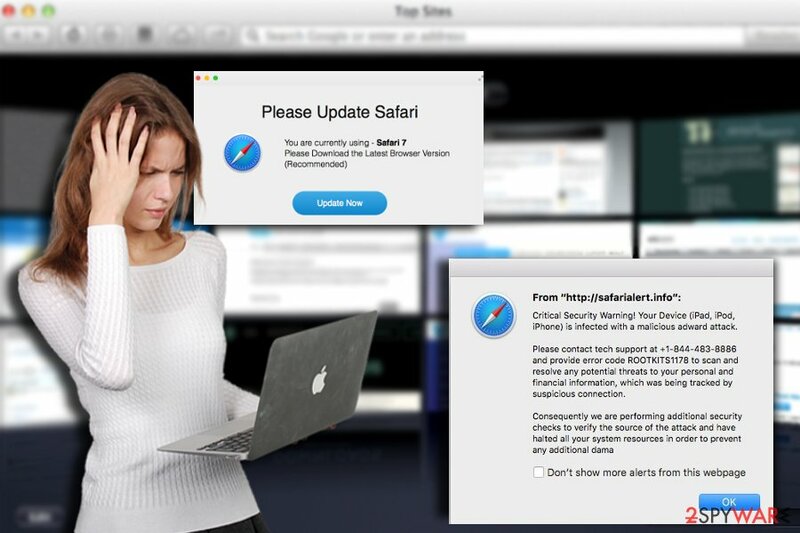 Safari tech support scams and forged updates are the most popular versions of this Safari browser virus. Because people get scared and reveal the important information like account credentials to the people who disguise as IT experts. Speaking of the latter, you may easily tell a difference between legitimate update alerts and fake pop-up notifications simply by looking at the URL domain promoting such update. Even if the very notification may seem identical to the original, shady URL random address consisting of multiple numbers and characters will hint that the update is not supported by Apple company. Another highly popular tendency for a redirect virus to misguide you to unknown websites which ask you to install a questionable Adobe Flash Player or another tool. You should keep your software up-to-date more frequently so these fake updates and promotional content couldn't trick you into installing questionable applications. Make sure to remove Safari virus using proper tools that you got from the official provider also. Safari redirect virus may trigger ample of different scenarios: cram you with ads or direct to a corrupted pornographic web site. Some of such domains that Safari redirect virus exposes you to even behave quite aggressively: you are asked to enable an extension in order to leave the page. In those cases, there is no need to enable any add-ons, but instead forcefully shut down it. Other variations of a browser redirect virus operate via web scripts which might direct to the web pages supposedly alarming you about your infected computer. Researchers note that developers of such browser threats exploit the name of a well-known threat to leave a more intimidating impression. Claims that your computer will be “disabled” or “blocked” are just absurd. Such messages always contain a phone number and urge you to take immediate action within 5 minutes. In those cases, you can simply close the tab via the Activity Monitor. Any interaction may lead to more severe malware infiltration than Safari redirect virus. Another possible scenario of a Safari virus is that it may direct to a website containing exploit kits. The latter has been widely used by certain ransomware developers, such as Cerber or CryptoMix. In addition, you should be aware that redirect infections also contribute to spying to users. Since it operates via web scripts, they may be used to collect information identifying users’ browsing habits. Safari redirect virus can access information like your IP address, location, most viewed and searched items or even your activity on social media. It is possible that they may also attempt to collect personal details. As a result, soon your email spam folder might be crammed with messages offering disputable products or services. In some cases, a more menacing attachment might be delivered with such email as well. Speaking of mobile users, who are using Safari mobile version, should be extremely vigilant. Certain variations of browser redirect infections may not simply cram you with ads, but redirect you to a shady domain before diverting you to a legitimate website, Google, Yahoo, or Amazon, for instance. If you are dealing with a program that affects your browser, you have more chances to curb it and avoid it. Observing the above-discussed operation peculiarities, redirect malware operates via web scripts which are not visible for ordinary users. However, their “shapeless” form lets them execute several commands. You are most likely to encounter them in peer-to-peer file sharing domains or ad-supported movie streaming and gaming sites. Such domains often contain such ads as “No one has played this game..”, “Things no one knew about…”, etc. Such domains often contain fake buttons suggesting you install highly dubious virus scanners. If you encountered hijack through this method, you will need the assistance of malware elimination tool to help you eradicate the infection. In addition, though such browser redirects infection does not function via apps, you should still pay attention to the installation wizards. Despite what program, you download, opt for “Custom” settings to detect irrelevant add-ons and deselect them. Choosing Advanced installations always gives you the advantage of de-selecting additional programs from the download list. In order to detect and delete all components and the browser virus, you may combine two methods – automatic Safari virus removal and manual. As for the latter, below guide will instruct how you can delete all shady extensions possibly related with the annoying redirect phenomenon. The instructions will also show how to perform full browser reset to get rid of web scripts. This action will also help you remove Safari virus. You may also review the list of system apps to check whether no questionable applications settled on the computer. 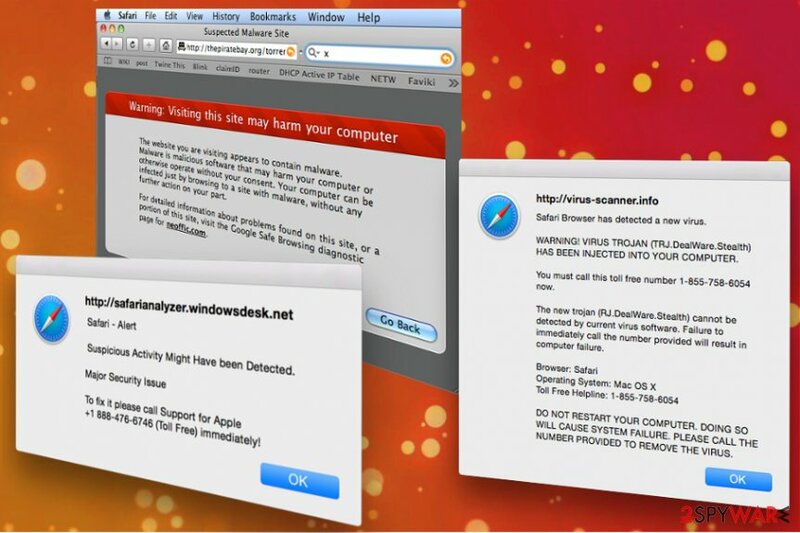 Make sure you attentively follow the instructions to fully eliminate Safari redirect virus. In case you got directed to a browser tech support scam, you may need to launch Activity Monitor, find the process indicating the browser activities and click Force Quit. Here, select Extensions and look for Safari redirect or other suspicious entries. Click on the Uninstall button to get rid each of them. Now you will see a detailed dialog window filled with reset options. All of those options are usually checked, but you can specify which of them you want to reset. Click the Reset button to complete Safari redirect removal process. ^ Safari virus redirect website. Discussions. Apple community forum. ^ Tim Hardwick. Researchers Uncover macOS and Safari Exploits at Pwn2Own 2017. MacRumours. News and rumors you care about. ^ Jonny Evans. Warning as Mac malware exploits climb 270%. Computerworld. IT news, careers, business technology and reviews. ^ What is weak SSL encryption?. SSLShopper.SSL Certificate Comparison and Reviews. ^ Udenvirus. Udenvirus. Spyware related news. ^ Margaret Rouse. Exploit kits. Techtarget. Definitions from what is. ^ Thomas Fox-Brewster. Creepy 'FruitFly' Surveillance Malware Hits American Apple Macs. Forbes. News, Security, Entertainment, Finance, Lifestyle. ^ Eric Ravenscraft. Google Will Now Warn You About Sites With Fake "Download" Buttons. LifeHacker.Tips, tricks, and downloads to get things done. This entry was posted on 2019-01-10 at 03:16 and is filed under Browser Hijackers, Mac Viruses, Viruses. You can quickly scan the QR code with your mobile device and have Safari redirect virus manual removal instructions right in your pocket. How did you remove Safari redirect virus?